Canker sores are small but painful grey or yellow blisters in the mouth, outlined by a red ‘border’. 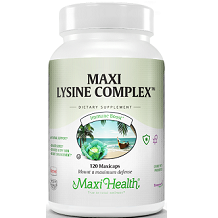 Our review examines a natural supplement in a gluten-free and vegetarian-friendly format that is marketed as a treatment for canker sores, namely Maxi Lysine Complex Review. It is also intended as a remedy for cold sores. Our review only examines the potential efficacy with regard to canker sores. Canker sores can be caused by exhaustion, a lack of essential vitamins, consuming too much acid-rich foods or food allergies. It can also be as a result of having a cold or the flu, dental work, fatigue, stress, experiencing hormone fluctuations and a number of other causes. L-Lysine is an amino acid which is obtained from proteins, most commonly. A L-Lysine deficiency has been linked to canker sore outbreaks. The exact reason for this though remains unclear. The main ingredient in these capsules is therefore the amino acid L-Lysine, in the maximum recommended daily intake for canker sores. It is not clear exactly why L-Lysine helps but anecdotal evidence suggests that doing so leads to fewer outbreaks. The Bifidobacterium bifidum is a probiotic which allows L-Lysine to be absorbed in the gut. L-Lysine is a broad spectrum treatment for a number of things. It is not necessarily a targeted canker sore treatment. It supports the production of antibodies, muscle protein, hormones and enzymes. It also helps the body metabolize carbohydrates and produce energy. This product is as much an aid to overall health, strengthened immunity and digestive health as it is to canker sores. It seems the rationale has therefore been to increase overall immunity and well-being. This decreases the likelihood of sores due to stress, colds and the flu. Take two capsules before meals, with water. An overdose or sensitivity to L-Lysine can cause diarrhea and gallstones. If you have kidney or liver issues, are pregnant or are breastfeeding, get medical clearance first. You can buy a bottle of 120 capsules on Amazon for $30.77. There do not appear to be any bigger volume discounts. The product comes with a quality guarantee. No explicit money-back guarantee appears to be in place. However, consumers are encouraged to contact Maxi Health should they not be satisfied with any product. This product is free from soy, wheat, salt, sugar, milk, yeast, gluten, artificial flavors, colorings or preservatives so is safe for many allergy sufferers. We view the inclusion of a probiotic as a positive. There is a correlation between gut health and brain functioning, and the brain’s ability to regulate anxiety levels. Stress and anxiety are health factors that can lead to canker sores. It is certainly likely to help prevent outbreaks, given that the synthesis is geared towards optimal health in general. We are not sure about the efficacy of this product as a targeted treatment for canker sores when they’ve arisen. In other words, it is doubtful that the product performs better at healing the sores in a shorter time frame than some other products. It also treats cold sores, for example, which are two intrinsically different conditions. The lack of consumer reviews in general does not help us form an opinion to the contrary. We would also caution consumers to buy supplements with well-defined money-back guarantees. Perhaps it is best to give this supplement a try if you not only have canker sores, but also need help with digestive health and general well-being, and don’t mind if the sore does not start healing within a few hours.